First linked with a move to Manchester City in January, Borussia Dortmund midfielder Julian Weigl has been one of the more persistently linked players throughout the year. However, despite the rumours of a move to the Etihad never going away, the 21-year-old pass master today renewed his contract with BVB until 2021. 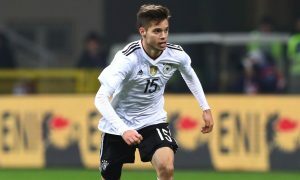 Pep Guardiola has openly praised Weigl in the past and it has been reported in Germany that he was disappointed when Dortmund beat Bayern Munich to the youngster’s signature in 2015. The former 1860 Munich captain has won comparisons to the man Guardiola built his Barcelona midfield around, Sergio Busquets, because of his incredible passing ability and tactical intelligence. Weigl’s new deal doesn’t necessarily mean City will give up on signing him in the next year or two, but makes the task much more difficult. The German international is the second player heavily linked with City to have renewed his contract, following Juventus defender Leonardo Bonucci.